Electric underfloor heating system for laminate, carpet, engineered wood and other approved floating floor finishes. What project is the Foil Heater designed for? 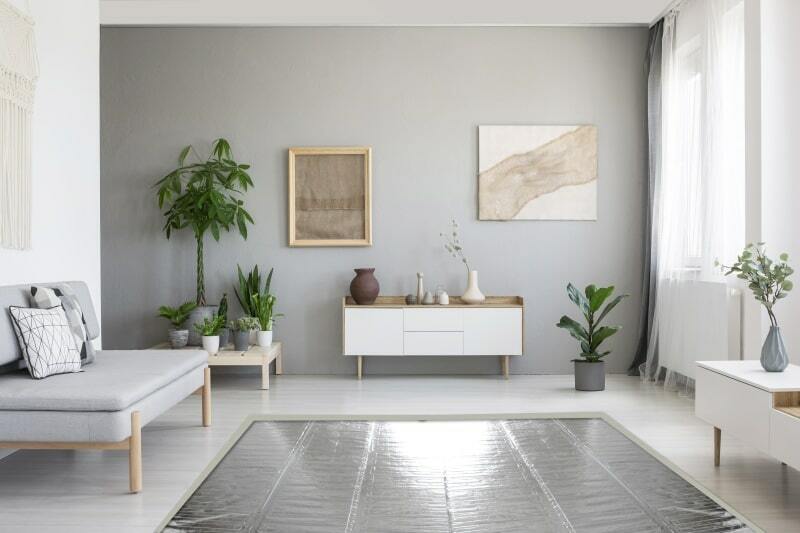 Foil underfloor heating is an ideal heater for larger areas and for use with so-called floating floors such as laminate, engineered wood, and carpet. Simple to install, the Foil Heater delivers a consistent heat distribution with the thermal properties of the reinforced aluminum foil used in the heater helping to spread the heat evenly. Electric foil heating mats can be used both as a primary or secondary heating source in all rooms and projects that adhere to Building Regulations. The foil layer acts as a continuous earth layer within the floor construction whilst also diffusing the heat evenly and away from the heating cable itself and because it is installed directly under the floor finish, no self-levelling is required. Ideal for regular shaped rooms, the 20″ wide foil mats can be rolled out across the floor in parallel runs. In some instances, you may need to cut, turn, and flip the mat to suit the room without affecting the heating cable. Read more about the installation of the Foil Heating System below. If you are using floor coverings such as engineered wood or laminate the foil heater is recommended to be used in conjunction with our insulated underlay. Insulated underlay is always recommended on a concrete slab. Insulated underlay on your subfloor provides protection for the Foil Heater while allowing the heat to easily pass through to the final floor finish providing maximum comfort. However, note that foil and insulated underlay are not recommended in wet rooms (such as bathrooms). If you are using vinyl or carpet in a wet room, consider using compatible electric systems such as the DCM-PRO or StickyMat systems; all installed with a self-levelling compound for waterproofing. Foil underfloor heating is an ideal heater for larger areas and for use with so-called floating floors such as laminate, engineered wood, and carpet. If you are installing on a concrete slab or under floor coverings such as laminate or engineered wood the foil heater should be used in conjunction with our soft insulation. The soft insulation subfloor provides protection for the Foil Heater while allowing the heat to easily pass through to the final floor finish providing maximum comfort. The Warmup Foil Heater is an electric underfloor heating system designed for laminate and engineered wood. Certain wood flooring finishes are not recommended for use with Warmup foil mats including vinyl, wood flooring thicker than 18mm, wood flooring with metallic strips as part of their locking systems (these metallic strips may damage the Foil mats) or any wood flooring with a pad already attached. In case you have any concerns, check with your chosen flooring supplier that your flooring option is compatible with an electric Foil Heating System. Fitted between the insulating layer and the floating floor deck the heater adds negligible height to the installation. For wooden floors or similar, the thermal resistance should not exceed 0.15m² K/W. The Warmup Foil Heater is an electric underfloor heating system also designed for carpet. When installing the Foil Heating System under a carpet there are a few key differences. Warmup recommends maintaining a minimum of 12″” off the walls to avoid any damage when the carpet is installed. Warmup soft insulation is not required under the foil heating system if you are using a carpet pad. In place of soft insulation, be sure the FOIL heating system is sandwiched between the pad and carpet to protect the foil heater and to allow heat to easily pass through to the final floor finish providing maximum comfort. In general, Foil heating mats are very resistant. You can even steam-clean your carpets over the foil heater. Some flooring manufacturers only allow the use of underfloor heating systems with their flooring when the system is embedded within a leveling compound. It is important that you check with the carpet flooring manufacturer on the types of underfloor heating system that are suitable. Before installing a Warmup electric foil heating system, always check the subfloor has adequate thermal insulation. This is particularly important where the foil heaters will be used as a primary heat source. The heater must be installed on top of a suitable soft insulation. This is necessary to prevent the heater from being damaged when the weight of furniture and people on the floor are added. 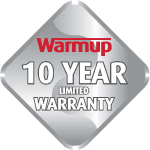 Improved savings can be achieved by using Warmup Insulated Underlay underneath the heater as this reduces the heat-up time by at least 50%, and results in cost-savings. Electric Foil underfloor heating is simple to install by rolling the mats out across the floor in parallel runs. The Foil Heater is made up of a fibre reinforced foil wrapped around a thin multi-strand, dual-core heating cable that is insulated with an advanced fluoropolymer. The foil provides a continuous earth layer within the floor construction whilst diffusing the heat away from the heating cable. The Warmup Foil Mats are fitted directly on top of the insulation or carpet pad and directly under the flooring. Always carry out a heat loss calculation prior to the installation to ensure the heater will provide enough heat for your room. Ensure you use the separate foil strips provided to bridge any gaps when cutting and turning the mats to suit the room. This is important to keep the earth intact. The foil heating mat must be completely flat. Care should be taken not to fold or crease the mats at any time during installation. If you accidentally damage the heating system during installation, return it to Warmup and we will replace it with another heater of the same make and model free. This product comes with a 10-Years Warranty. We are completely confident in the standard of our products. A thin insulation barrier to protect the foil heater and help radiate heat upward.